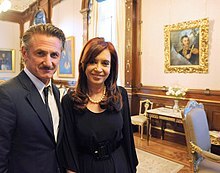 Sean Justin Penn (born August 17, 1960) is an American actor, filmmaker, and political activist. He has won two Academy Awards , for his roles in the mystery drama Mystic River (2003) and the biopic Milk (2008). Penn began his acting career in television with a brief appearance in episode 112 of Little House on the Prairie (December 4, 1974), directed by his father Leo Penn. Following his film debut in the drama Taps (1981) and a diverse range of film roles in the 1980s, including Fast Times at Ridgemont High (1982), Penn garnered critical attention for his roles in the crime dramas At Close Range (1986), State of Grace (1990), and Carlito’s Way (1993). He became known as a prominent leading actor with the drama Dead Man Walking (1995), for which he earned his first Academy Award nomination and the Best Actor Award at the Berlin Film Festival. Penn received another two Oscar nominations for Woody Allen‘s comedy-drama Sweet and Lowdown (1999) and the drama I Am Sam (2001), before winning his first Academy Award for Best Actor in 2003 for Mystic River and a second one in 2008 for Milk. He has also won a Best Actor Award of the Cannes Film Festival for the Nick Cassavetes-directed She’s So Lovely (1997), and two Best Actor Awards at the Venice Film Festival for the indie film Hurlyburly (1998) and the drama 21 Grams (2003). Penn made his feature film directorial debut with The Indian Runner (1991), followed by the drama film The Crossing Guard (1995) and the mystery film The Pledge (2001). Penn directed one of the 11 segments of 11’09″01 September 11 (2002), a compilation film made in response to the September 11 attacks. His fourth feature film, the biographical drama survival movie Into the Wild (2007), garnered critical acclaim and two Academy Award nominations. In addition to his film work, Penn is known for his political and social activism, including his criticism of the George W. Bush administration, his contact with the Presidents of Cuba and Venezuela, and his humanitarian work in the aftermath of Hurricane Katrina (2005) and the 2010 Haiti earthquake. In January 2016, Penn published an interview (conducted in October 2015) with Mexican drug lord Joaqun “El Chapo” Guzmn in Rolling Stone. Mexican authorities dismissed the level of importance given by American media to Penn in regard to Guzman’s eventual recapture, instead placing importance on actress Kate del Castillo‘s continued communications with Guzman. Penn was born in Los Angeles County, California, to actor and director Leo Penn, and actress Eileen Ryan (ne Annucci). His older brother is musician Michael Penn. His younger brother, actor Chris Penn, died in 2006. His paternal grandparents were Ashkenazi Jewish emigrants from Lithuania and Russia, while his mother is a Catholic of Irish and Italian descent. Penn was raised in a secular home and attended Santa Monica High School. He began making short films with some of his childhood friends, including actors Emilio Estevez and Charlie Sheen, who lived near his home. Penn appeared in a 1974 episode of the Little House on the Prairie television series as an extra when his father, Leo, directed some of the episodes. Penn launched his film career with the action-drama Taps (1981), where he played a military high school cadet. A year later, he appeared in the hit comedy Fast Times at Ridgemont High (1982), in the role of surfer-stoner Jeff Spicoli; his character helped popularize the word “dude” in popular culture. Next, Penn appeared as Mick O’Brien, a troubled youth, in the drama Bad Boys (1983). The role earned Penn favorable reviews and jump-started his career as a serious actor. Penn played Andrew Daulton Lee in the film The Falcon and the Snowman (1985), which closely followed an actual criminal case. Lee was a former drug dealer by trade, convicted of espionage for the Soviet Union and originally sentenced to life in prison, but was paroled in 1998. Penn later hired Lee as his personal assistant, partly because he wanted to reward Lee for allowing him to play Lee in the film; Penn was also a firm believer in rehabilitation and thought Lee should be successfully reintegrated into society, since he was a free man again. Penn starred in the drama At Close Range (1986) which received critical acclaim. He stopped acting for a few years in the early 1990s, having been dissatisfied with the industry, and focused on making his directing debut. The Academy Awards first recognized his work in nominating him for playing a racist murderer on death row in the drama film Dead Man Walking (1995). He was nominated again for his comedic performance as an egotistical jazz guitarist in the film Sweet and Lowdown (1999). 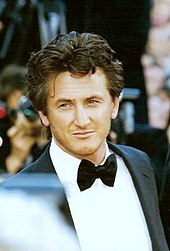 He received his third nomination after portraying a mentally handicapped father in I am Sam (2001). Penn finally won for his role in the Boston crime-drama Mystic River (2003). In 2004, Penn played Samuel Bicke, a character based on Samuel Byck, who in 1974 attempted and failed to assassinate President Richard Nixon, in The Assassination of Richard Nixon (2004). The same year, he was invited to join the Academy of Motion Picture Arts and Sciences. Next, Penn portrayed governor Willie Stark (based on Huey Long) in an adaptation of Robert Penn Warren‘s classic 1946 American novel All the King’s Men (2006). The film was a critical and commercial failure, named by a 2010 Forbes article as the biggest flop in the last five years. In November 2008, Penn earned positive reviews for his portrayal of real-life gay-rights icon and politician Harvey Milk in the biopic Milk (2008), and was nominated for best actor for the 2008 Independent Spirit Awards. The film also earned Penn his fifth nomination and second win for the Academy Award for Best Actor. Penn starred as Joseph C. Wilson in Fair Game (2010), a film adaptation of Valerie Plame‘s 2007 memoir. He co-starred in the drama The Tree of Life (2011), which won the Palme d’Or at the 2011 Cannes Film Festival. In 2015, Penn starred in The Gunman, a French-American action thriller based on the novel The Prone Gunman, by Jean-Patrick Manchette. Jasmine Trinca, Idris Elba, Ray Winstone, Mark Rylance and fellow Oscar-winner Javier Bardem appear in supporting roles. Penn plays Jim Terrier, a sniper on a mercenary assassination team who kills the minister of mines of the Congo. Penn made his directorial debut with The Indian Runner (1991), a crime drama film based on Bruce Springsteen‘s song “Highway Patrolman“, from the album Nebraska (1982). He also directed music videos, such as Shania Twain‘s “Dance with the One That Brought You” (1993), Lyle Lovett‘s “North Dakota” (1993), and Peter Gabriel‘s “The Barry Williams Show” (2002). He has since directed three more films, all well received by critics: the indie thriller The Crossing Guard (1995), the mystery film The Pledge (2001), and the biographical drama survival film Into the Wild (2007). Penn’s fifth directorial feature The Last Face (2016) premiered at the 2016 Cannes Film Festival. Penn was engaged to actress Elizabeth McGovern, his co-star in Racing with the Moon (1984). He met pop singer Madonna in February 1985, and they married that August on her birthday. The two starred in the panned and much-derided Shanghai Surprise (1986), directed by Jim Goddard, and Madonna dedicated her third studio album True Blue (1986) to Penn, referring to him in the liner notes as “the coolest guy in the universe”. The relationship was marred by violent outbursts against the press, including one incident when Penn was arrested for assaulting a photographer on a film set; Penn was sentenced to 60 days in jail in mid-1987, of which he served 33 days. Madonna filed for divorce in December 1987 but later withdrew the papers, only to file them again in January 1989. Penn was alleged to have struck Madonna on multiple occasions, but in 2015 Madonna stated the allegations were “completely outrageous, malicious, reckless, and false. At the end of his first marriage, Penn moved in with actress Robin Wright, and their first child, a daughter named Dylan Frances, was born April 13, 1991. Their second child, son Hopper Jack, was born August 6, 1993. Penn and Wright separated in 1995, during which time he developed a relationship with Jewel, after he spotted her performing on Late Night with Conan O’Brien. He invited her to compose a song for his film The Crossing Guard (1995) and followed her on tour. Penn and Wright reconciled, married on April 27, 1996, and lived in Ross, California. The couple filed for divorce in December 2007 but reconciled several months later, requesting a court dismissal of their divorce case. In April 2009, Penn filed for legal separation, only to withdraw the case once again when the couple reconciled in May. On August 12, 2009, Wright Penn filed for divorce again. The couple’s divorce was finalized on July 22, 2010; the couple reached a private agreement on child and spousal support, division of assets, and custody of Hopper, who was almost 17 at the time. In December 2013, Penn began dating actress Charlize Theron. The two announced their engagement in December 2014. Theron ended their relationship in June 2015. Penn has been outspoken in supporting numerous political and social causes. 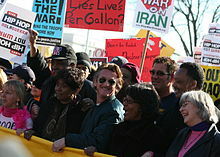 On December 1316, 2002, he visited Iraq to protest the Bush Administration’s apparent plans for a military strike on Iraq. On June 10, 2005, Penn made a visit to Iran. Acting as a journalist on an assignment for the San Francisco Chronicle, he attended a Friday prayer at Tehran University. On January 7, 2006, Penn was a special guest at the Progressive Democrats of America, where he was joined by author and media critic Norman Solomon, Democratic congressional candidate Charles Brown, and activist Cindy Sheehan. The “Out of Iraq Forum”, which took place in Sacramento, California, was organized to promote the anti-war movement calling for an end to the War in Iraq. On December 18, 2006, Penn received the Christopher Reeve First Amendment Award from the Creative Coalition for his commitment to free speech. In August 2008, Penn made an appearance at one of Ralph Nader‘s “Open the Debates” Super Rallies. He protested the political exclusion of Nader and other third parties. In October 2008, Penn traveled to Cuba, where he met with and interviewed President Ral Castro. In February 2012, he stood beside Hugo Chvez while Venezuela supported the Syrian government during the 20112012 Syrian uprising. On October 18, 2002, Penn placed a US$56,000 advertisement in the Washington Post asking then President George W. Bush to end a cycle of violence. It was written as an open letter and referred to the planned attack on Iraq and the War on Terror. On April 19, 2007, Penn appeared on The Colbert Report and had a “Meta-Free-Phor-All” versus Stephen Colbert that was judged by Robert Pinsky. This stemmed from some of Penn’s criticisms of Bush. His exact quote was “We cower as you point your fingers telling us to support our troops. You and the smarmy pundits in your pocket those who bathe in the moisture of your soiled and blood-soaked underwear can take that noise and shove it.” He won the contest with 10,000,000 points to Colbert’s 1. On December 7, 2007, Penn said he supported Ohio Congressman Dennis J. Kucinich for U.S. President in 2008, and criticized Bush’s handling of the Iraq war. Penn questioned whether Bush’s twin daughters supported the war in Iraq. In September 2005, Penn traveled to New Orleans, Louisiana, to aid Hurricane Katrina victims. He was physically involved in rescuing people, although there was criticism that his involvement was a PR stunt as he hired a photographer to come along with his entourage. Penn denied such accusations in an article he wrote for The Huffington Post. Director Spike Lee interviewed Penn for Lee’s documentary about Hurricane Katrina, When the Levees Broke: A Requiem in Four Acts (2006). After the 2010 Haiti earthquake, Penn founded the J/P Haitian Relief Organization, which has been running a 55,000 person tent camp. Due to his visibility as an on-the-ground advocate for rescue and aid efforts in the aftermath, Penn was designated by president Michel Martelly as Ambassador-at-Large for Haiti, the first time that a non-Haitian citizen has been designated as such in the country’s history. Penn received the designation on January 31, 2012. Penn gained significant attention in the Pakistan media when he visited Karachi and Badin in 2012. On March 23, 2012, he visited flood-stricken villages of Karim Bux Jamali, Dargah Shah Gurio and Peero Lashari in Badin District. He was accompanied by US Consul General Willian J. Martin and distributed blankets, quilts, kitchen items and other goods amongst flood survivors. On March 24, 2012, Penn also visited Bilquis Edhi Female Child Home and met Pakistans iconic humanitarian worker Abdul Sattar Edhi and his wife, Bilquis Edhi. He also laid floral wreaths and paid respect at the shrine of Abdullah Shah Ghazi. Penn is believed to have played a role in getting American entrepreneur Jacob Ostreicher released from a Bolivian prison in 2013, and was credited by Ostreicher for having personally nursed him back to health upon his release. The comments were taken as support of Argentina’s claim to the islands and evoked strong reactions in the British media, with one satirical article in The Daily Telegraph requesting that Penn “return his Malibu estate to the Mexicans“. Lauren Collins of The New Yorker wrote: “As of today, Sean Penn is the new Karl Lagerfeldthe man upon whom, having disrespected something dear to the United Kingdom, the British papers most gleefully pile contempt”. Penn later claimed that he had been misrepresented by the British press and that his criticism of “colonialism” was a reference to the deployment of Prince William as an air-sea rescue pilot, describing it as a “message of pre-emptive intimidation”. He claimed that the Prince’s posting meant “the automatic deployment of warships”, and stated: “My oh my, aren’t people sensitive to the word ‘colonialism’, particularly those who implement colonialism.” In a piece written in The Guardian, Penn wrote that “the legalisation of Argentinian immigration to the Malvinas/Falkland Islands is one that it seems might have been addressed, but for the speculative discovery of booming offshore oil in the surrounding seas this past year”. He further wrote that “irresponsible journalism” had suggested “that I had taken a specific position against those currently residing in the Malvinas/Falkland Islands, that they should either be deported or absorbed into Argentine rule. I neither said, nor insinuated that”. His remark caused some people to be offended by the comments, deeming them racist towards Latin Americans, and offensive to those who attempt to legally immigrate into the United States. In an interview published September 16, 2015, director and showrunner Lee Daniels responded to criticism about Terrence Howard‘s continued career in light of his domestic violence issues by referencing Penn’s rumored history of domestic violence, saying: ” ain’t done nothing different than Marlon Brando or Sean Penn, and all of a sudden he’s some fin’ demon.” In response, Penn launched a $10 million defamation suit against Daniels, alleging that he had never been arrested for or charged with domestic violence. Penn dropped the lawsuit in May 2016 after Daniels retracted his statement and apologized. A day after Mexican officials announced the capture of Joaqun “El Chapo” Guzmn in a bloody raid, Rolling Stone revealed on January 9, 2016 that Sean Penn, along with actress Kate del Castillo, had conducted a secret interview with El Chapo prior to his arrest. Del Castillo was contacted by Guzmn’s lawyer (who was under CISEN surveillance) to talk about producing a biographical film over Guzmn and communication increased following Guzmn’s escape from prison in July 2015. The deal for the interview was brokered by del Castillo. According to published text messages with del Castillo, Guzmn did not know who Sean Penn was. CISEN released photographs of del Castillo at the meetings with Guzmn’s lawyers and of the arrival of the actress and Penn to Mexico. The interview was criticized by some, including the White House, which called the interview “maddening”. Mexican authorities said they were seeking to question Penn over the interview, which had not been approved by either the American or Mexican government. Penn and del Castillo’s meeting with Guzmn is under investigation by the Attorney General of Mexico. Penn has appeared in more than 50 films and won many awards during his career as an actor and director. He has won two Academy Awards for Best Actor for Mystic River (2003) and Milk (2008), and was nominated three more times in the same category for Dead Man Walking (1995), Sweet and Lowdown (1999), and I Am Sam (2001). He also received a Directors Guild of America nomination for directing Into the Wild (2007).